When Romantic Religion was first published thirty-five years ago, no one dreamed that The Lord of the Rings and The Chronicles of Narnia would one day be box office hits and that their authors, J.R.R. Tolkien and C.S. Lewis, would be household names. R.J. Reilly’s remarkably readable and perceptive book about the two writers and their two brilliant friends, Owen Barfield and Charles Williams, was soon treasured by fans as the best book on their circle of writer–philosophers, the Inklings. Romantic Religion went out of print and commanded high prices on the rare-book market. Now it has finally been republished so that a new generation of readers can delve into this book, whose relevance has kept pace with the growing reputations of its subjects. 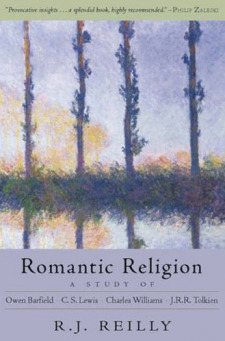 The title Romantic Religion reflects Reilly’s premise that these four thinkers share a "matured romanticism." For them, creative imagination is central, with literary and religious views intimately related. Reilly devotes an insightful chapter to each of the writers and, in his conclusion, discusses their differences and similarities. Barfield fans will be especially impressed by the author’s ability to clarify Barfield’s famously condensed prose. This is the first study to examine in depth the theological and philosophical implications of the work of that remarkable group of writers now called the Oxford Christians. In focusing on the central religious concern of the group, R. J. Reilly provides an approach that is destined to become normative. This is not a work of conventional literary biography (even less hagiography) or conventional literary history. Rather, it is intellectually informed criticism that makes possible a deep understanding of the enduring dimensions of the work of four of the most attractive and challenging "writers of our times (Tennyson)." With the republication of Romantic Religion, this wise, penetrating picture of our own possibilities is put before us once more.